Villeroy and Boch USA is actually a German based company who distributes dinnerware internationally. Their specialty is porcelain dinnerware and bone china dinnerware; however, they also offer other products including glassware, flatware, bakeware, serveware, and home and table décor. The company has been in business since 1748. Throughout the years they have managed to develop an international reach with their lifestyle brands. They have been known to distribute to renowned restaurants and royalty, as well as providing products for use in the Titanic. Fortunately, they also make dinnerware available for home use. 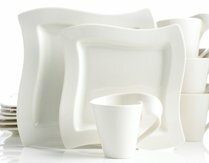 Some distributors offer dinnerware sets; however, most of the products from Villeroy and Boch are available as open stock dinnerware. When I was looking into the products offered by Villeroy and Boch, I found an espresso set that I just fell in love with. It's simple, useful and very unique. In my opinion, this would make a great gift for a coffee lover. This is part of the New Wave collection , which I find to be very distinguished. They have some neat dishes and flatware in that line. It is possible to choose what you will really use since you can buy in open stock. They have some awesome patterns that are graceful and would be great for decorating a kitchen or dining room, or setting a formal table in both casual dinnerware sets and fine dining dinnerware.. This is just a few of the patterns available from Villeroy and Boch. Click here to see more of the products they offer.